"Anthony Bourdain Parts Unknown" takes a close look at the mash-up of cultures that comprise this uniquely American state. Tony and crew sample New Mexico's food -- a combination of Spanish, Mediterranean, Mexican, Pueblo and even chuck-wagon influences. New Mexico is also a land of drugs, guns, monster vehicles, and possibly extraterrestrials. It may also be the perfect place to investigate the underside of the Western cowboy ideal. 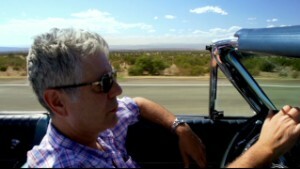 Tony drives along old Route 66, which runs through New Mexico "like a collapsed vein" through Santa Fe and Albuquerque. 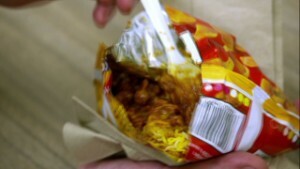 Bourdain: "My face is burning off"
As much as I'd like to wax effusively about the delights of the Frito Pie, a shamefully delightful flavor bomb that pleases in equal measure to its feeling in the hand like a steaming dog turd, I suspect what people are going to talk about when they see our New Mexico episode is the sight of me -- socialist sympathizer, leftie, liberal New Yorker -- gleefully hammering away with an AR-15, an instrument of mayhem and loathing that also has the distinction of being America's favorite weapon. I like shooting them. I like holding their sleek, heavy, deadly weight in my hands. I like shooting at targets: cans, paper cutouts and even though I'm not a hunter, the occasional animal. Though I do not own a gun, I would -- if I lived in a rural area like, say, Montana -- consider owning one. Whatever my feelings about gun regulation and my worries, as a father, about what kind of world my daughter will have to live in, I think I should have as many guns as I like. Even Ted Nugent should have guns. He likes them a lot. They make him happy -- and as offensive as I may find a lot of what comes out of his mouth, I'm pretty sure, based on firsthand experience, that he's a responsible gun owner. You, however, I'm not so sure about. And my next door neighbor. I'm not so sure about him either. I'd like to know a bit more about him before he takes possession of an M-16 and a whole lot of extra clips. If we accept the proposition that that a gun is simply a tool -- with potentially lethal properties -- it follows that it's not too different from a vehicle. And I would like to know a LOT more about you before I'm comfortable putting you behind the wheel of a 16-wheeler. I'd like to know if you're a maniacal drunk or crackhead before allowing you to barrel down that highway with three tons of trailer swinging behind you. If you favor an aluminum foil hat as headgear, I would have concerns about entrusting you with so much power to harm so many in so little time. That's a reasonable thing for a society to ponder on, I think. The upcoming New Mexico show is not about guns. Though there are, as in much of America between the coasts, many guns there. This show is about the American cowboy ideal, about the romantic promise of the American West, about individuality and the freedom to be weird. New Mexico, where Spanish, Mexican, Pueblo, Navajo and European cultures mix and have mixed -- at times painfully and lately, more easily. New Mexico, where everyone from artists, hippies, cowboys, poets, misfits, refugees and tourists of every political stripe have interpreted the promise of its gorgeous, wide-open spaces and the freedom that it offers in their own, very different ways. New Mexico is an enchanted land, where people are largely free to create their own world. Americans are traditionally, by nature, suspicious and even hostile to government. Whether we admit it or not, we were, most of us, suckled on the idea that a "man" should solve his own problems -- that there are simple answers to complex questions. And that if all else fails, taking the situation into one's own hands -- violently -- is somehow "cleansing" and heroic. Whether playing cowboys and Indians as a child or watching films, those are our heroes and our icons: the lone gunman, the outlaw, the gangster, the ordinary man pushed too far. That's a uniquely American pathology. And even the ex-flower children who've escaped the cities of the East to put Indian feathers in their hair, turquoise around their neck and a battered pair of cowboy boots on are, on some level, buying in to that ethos of a mythical West. In New York, where I live, the appearance of a gun -- anywhere -- is a cause for immediate and extreme alarm. Yet, in much of America, I have come to find, it's perfectly normal. I've walked many times into bars in Missouri, Nevada and Texas where absolutely everyone is packing. I've sat down many times to dinner in perfectly nice family homes where -- at end of dinner -- mom swings open the gun locker and invites us all to step into the backyard and pot some beer cans. That may not be Piers Morgan's idea of normal. It may not be yours. But that's a facet of American life that's unlikely to change. I may be a New York lefty -- with all the experiences, prejudices and attitudes that one would expect to come along with that -- but I do NOT believe that we will reduce gun violence or reach any kind of consensus by shrieking at each other. Gun owners -- the vast majority of them I have met -- are NOT idiots. They are NOT psychos. They are not even necessarily Republican (New Mexico, by the way, is a blue state). They are not hicks, right-wing "nuts" or necessarily violent by nature. And if "we" have any hope of ever changing anything in this country in the cause of reason -- and the safety of our children -- we should stop talking about a significant part of our population as if they were lesser, stupider or crazier than we are. The batshit absolutist Wayne LaPierre may not represent the vast majority of gun owners in this land -- but if pushed -- if the conversation veers towards talk of taking away people's guns -- many gun owners will shade towards him -- and away from us. Gun culture goes DEEP in this country. A whole hell of a lot of people I've met remember daddy giving them their first rifle as early as age 6 -- and that kind of bonding -- that first walk through the early morning woods with your Dad -- that's deep tissue stuff. When people start equating guns -- ALL guns -- as evil -- as something to be eradicated, a whole helluva lot of people are going to get defensive. The conversation so far has illuminated, instead of any substantial issues, mostly the huge cultural divide between those like me who live in coastal cities with restrictive gun laws and that vast swath of America that lives very differently. We don't understand how they live. And they don't understand how we could POSSIBLY live the way we live. A little respect for that difference might be a good thing. The contempt, mockery and total lack of understanding for all those people "out there" by deep thinkers and pundits who've never sat down for a cold beer in a bar full of camo-wearing duck hunters is despicable and counterproductive. We are too busy expressing disbelief at the ways others have chosen to live to ever really talk about the nuts and bolts of making America safer and less violent. No middle ground is possible when even the notion of a sane, reasonable person who likes to shoot lots of bullets at stuff is seen as so foreign -- so "other." Maybe we would be better off -- safer, kinder to one another -- if we were Denmark or Sweden. But we are not. And riding across the incredible landscape of Ghost Ranch outside of Sante Fe, seeing the canyons and arroyos that so inspired Georgia O'Keefe and generations of artists, writers and seekers who followed, one is especially glad we are not. There are a lot of nice people in this country. A whole helluva lot of them, like it or not, own AR-15s. If we can't have at least have a conversation with them, sit down, break bread and talk about where we are going and how we are going to get there, there is no hope at all. As far as the much more important question of where I stand on the question of red chile or green? I'm green all the way. And New Mexico's got it best.